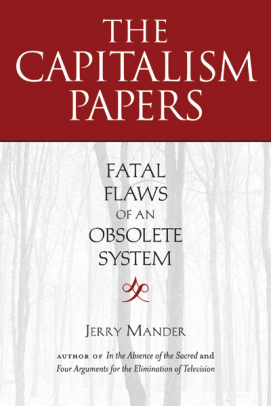 Jerry Mander is founder and distinguished fellow of the International Forum on Globalization, and was called “patriarch of the anti-globalization movement” by the New York Times. His early career was as president of a commercial ad agency, and then later, non-profit political advertising with Public Media Center, which concentrated on environmental and anti-war work. His previous books include Four Arguments for the Elimination of Television (1978) , In the Absence of the Sacred (1991), The Case Against the Global Economy (1996) , and Alternatives to Economic Globalization (2002). This article is reprinted from Chapter 10 of his new book, The Capitalism Papers: Fatal Flaws of an Obsolete System (Copyright © 2012 by Jerry Mander. Reprinted by permission of Counterpoint).